The following Happy Beginnings tale comes to us from Linda Latelle, founder of Magnificent Mutts Rescue in Illinois: “What if someone you loved and trusted tried to kill you just because you got sick? That’s what happened to Jessie, a sweet and trusting 3 year old husky mix. Jessie lived outdoors, on a farm in rural Kentucky, and was plagued by allergies and dermal fungal and bacterial infections to the point of misery from itching, irritation, and hair loss. Jessie’s owners had no interest in paying to have her infections treated, so they decided to “put her out of her misery” by shooting her. In January 2010, Jessie was following her would-be executioner and his .22 rifle out the woods when a concerned neighbor approached. The neighbor was horrified to learn of the plan, and more so to hear that this was the second attempt to destroy Jessie- the first time, she was shot 3 times, but survived and made her way back to the farm! The neighbor talked the farmer into surrendering Jessie to her on the spot. 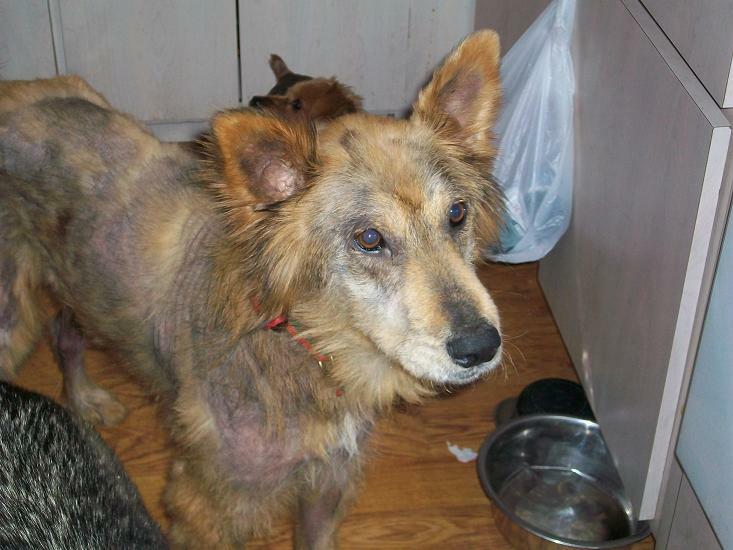 Jessie was taken to a local vet, where she was started on antifungal and antibiotic medications, the matted parts of her remaining raggedy coat were shaved off. Unfortunately, the kind and compassionate neighbor who saved Jessie’s life could not keep her, and sought help for Jessie through her local animal shelter. A sick dog at a rural shelter has virtually no chance of being adopted, so a plea to save Jessie went out to the animal rescue network. Magnificent Mutts spoke up for Jessie, and she was transported to Mutts’ vet in Elmhurst, Illinois. Thanks to generous donations from Mutts supporters, Jessie received further treatment there, including removal of the .22 caliber bullets and care for the resulting abscesses. Jessie was then spayed, dewormed, and vaccinated. From there, Jessie went to her foster home, where she enjoyed plentiful food, a warm bed, and loving care. It was expected that Jessie would spend a long time recuperating in foster care, but things moved more quickly for her. Less than 6 weeks after Jessie’s life was saved she met Chris and Jenny, who were deeply moved by her tragic story and intent on giving it a Happily Ever After ending. Chris and Jenny had looked at a number of dogs together before Chris met Jessie on his own, and he immediately felt a connection to her. Chris knew it would be tough to persuade Jenny to even meet poor bedraggled Jessie, but he appealed to Jenny’s kind nature: (Jessie’s) “ kind of messed up right now but I was a bit of a mess when you met me and you took a chance on me so can we take a chance on her?” Jenny couldn’t resist his plea, and Chris took her to meet Jessie. Jessie won Jenny’s heart as well, and she went home that day with her new family. Jenny writes, “We just knew we’d find a dog that was meant to be ours when we saw it, and we both knew it when we saw” Jessie. Jenny keeps Magnificent Mutts informed of Jessie’s progress. She writes that Jessie “is the perfect fit for our family and we are so happy to have found her… she seems happy to have found us, she’s adapted to our house like she’s always lived there.” And Jessie’s coat is growing back beautifully- her new vet expects her coat to re-grow all over within 6 weeks, and eventually regain its original lush golden glory. Jenny promises to send pictures of Jessie as she recovers, because “it’s fun to see the before and after pics”. Stories like Jessie’s are testimony to the kindness of strangers and to the trust and gratitude of the dogs they help. Millions of dogs pass through the shelter and rescue system each year, but not enough of them live to enjoy a Happily Ever After the way Jessie will. Jessie’s new Forever Family, Magnificent Mutts Rescue, and Jessie’s old neighbor are all proud to have been a part of this Happy Tail story. 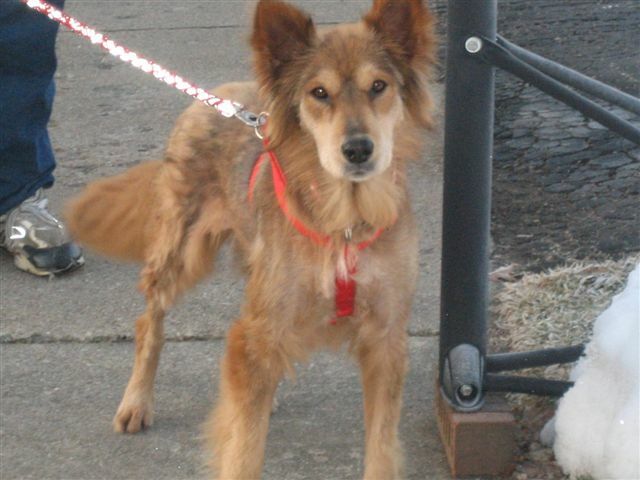 You can see Magnificent Mutts’ adoptable pets here.